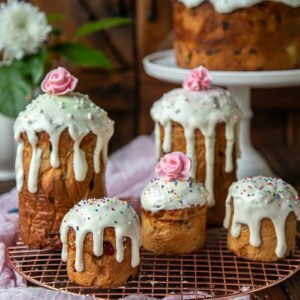 Paska Easter Bread is a sweetened buttery bread filled with lots of rum soaked raisins and white chocolate. Traditionally it is eaten on Easter, but can be made any time. Pour enough rum or warm water over the dried fruits to keep them submerged and allow them to rehydrate for 1 hour, or up to 1 week in advance. Cover the bowl and refrigerate if doing this more than 1 hour in advance. Then, drain the dried fruits and pat with paper towels to remove all moisture from the outside. Set aside or refrigerate. Prep: Grease a large bowl with oil or nonstick spray, set aside. Measure and prep all of the ingredients. Weigh the ingredients for best results. Check/proof your yeast if you're unsure if the yeast is still active, or if you're using active dry yeast instead of instant dried yeast. Combine and knead: Add the ingredients in the following order: 4 eggs, 3 to 8 tablespoons of sugar, 1 tsp of vanilla, 2 tbsp + 1 tsp of water, 350 g flour, 2 1/4 tsp of yeast and knead on low speed until it barely comes together in a mixer bowl or the bread machine. Then knead on medium-low speed for about 20 minutes (on a KitchenAid stand mixer - speed 3). If using the bread machine it should be turned on to the 1-hour dough cycle. The dough will be very thick at this point, this is OK. Check for gluten development (windowpane test). To do this take a walnut-sized piece of dough, flatten it out, then slowly stretch it until you can make it very thin and almost translucent. If the dough tears instead of getting thin, continue kneading until it gets to this stage. It might take longer or shorter than the indicated time. Go by the windowpane test and not the time. Add butter and salt: Next, add butter in halves, in small cubes and continue kneading until the butter is fully incorporated about 15-20 minutes. You might have to break the dough into small chunks to make the incorporation with the butter easier. DO NOT ADD ANY MORE FLOUR - it's ok if the dough is on the runny side. As continue kneading it will hold shape better, but still should not be firm. Add the re-hydrated, but well-drained or paper towel dried fruits, citrus zest, and chocolate chips into the dough. Knead until fully incorporated. Rise and chill: Transfer the dough to the greased bowl and allow the dough to rise at room temperature (see Note 3) for 1 hour, then cover and chill for at least 4 hours or up to 2 days. Only skip the refrigeration if you are really tight on time. Remove from the fridge and shape. 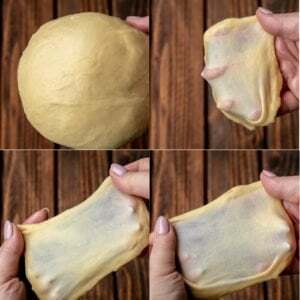 Punch down the dough and shape it into a round ball by tucking edges of the dough all around under itself until the top looks nice and smooth. Place inside the large 6 or 7-inch round and tall Panettone mold. For mini Easter breads, divide the dough between the 3 lined with parchment paper (see pix) 32 oz cans. Or divide between 9-12 small two inch round paper molds. Lightly brush the tops with whisked yolk. Place in a preheated to 350F oven and bake until the inside registers 185f - 190F degrees and the tops are golden in color. If the dough browns too fast, loosely tent the top with foil. For the 6-7 inch round molds, it should take about 55-65 minutes. For the 3.5-inch round molds, it should take around 35-40 minutes. The 2-inch round molds will take about 20 minutes. Remove from the oven and allow to cool completely. Then cover with glaze by spreading some of the powdered sugar glaze on top with a spoon or spatula, or dipping the smaller paska bread tops into the glaze. Sprinkle the sprinkles on top, if desired. Combine 1.5 cups powdered sugar, 1 egg and 1 tsp of lemon juice in a mixer and whip until the mixture is thick, but still flows in slow, lava-like motion, about 5-7 min. 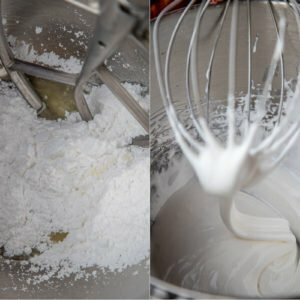 You can take a spoonful and allow it to drizzle down the inside of the bowl, if it flows down slow, leaving a nice drizzle, you can stop whipping. If not, just continue whipping until it's proper consistency.